Those of us who love British costume dramas always imagine ourselves in the gorgeous stately homes, chatting with Dukes and Countesses, dressed in the height of fashion and dripping with jewels. Shows such as Downton Abbey are so popular because while they show plenty of that sort of thing, we also get a glimpse behind the scenes to see all the effort it takes to keep such a huge place running so smoothly. 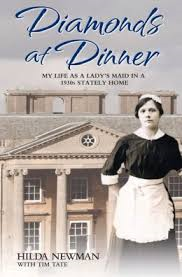 The new book Diamonds at Dinner is a memoir by 98 year old Hilda Newman, who actually worked in a stately home between the wars as a lady's maid. The first half of the book discusses Hilda's early life in the town of Stamford, which she describes as being "slap bang in the middle of England." Her father was actually fighting in World War I when she was born in 1916, but he returned home from the war without any physical disabilities. Unfortunately, he returned home to a country that had been changed forever. Unemployment was rampant, and he was no longer able to work in engineering field for which he had been trained. He set up a shoe cleaning and repair shop at home, and even worked at a nearby hotel shining shoes when necessary. It's really fascinating to read Hilda's descriptions of her life in a working class family in the 1920s and 1930s. She vividly describes what life was like before houses had electricity, indoor plumbing and refrigeration. Her parents are "respectable poor" -- hardworking people who wouldn't dream of ever straying outside the carefully defined rules that society set out for them. This is in contrast to the aristocratic family she would eventually work for. The Earl and Countess of Coventry lived in the stately Croome Court. When Hilda got her job at the house in 1925, she was working for the 10th Earl. His family had a colorful past, especially in the 19th century. There were scandalous elopements, illegitimate children, bankruptcies, gambling debts, and "airing of the family's dirty laundry" in public newspapers. Hilda contrasts this shocking and immoral behavior of people deemed "her betters" with the difficult but admirable lives of her parents. Children left school at age 14, and Hilda was apprenticed to a dressmaker. She had just finished her apprenticeship and was ready to start work, when her employer died. There were no jobs in the tailoring field available, so she took what job she could get, in the hotel laundry. This job quickly lost its charm, so she was excited when a co-worker told her about an opening for a lady's maid. Hilda applied, was accepted, and then had to convince her father to allow her to take the job. When she arrived at Croome Court, a day's journey by train from her little village, Hilda quickly felt out of her depth. Not only had she never seen such a large house before, but the inner hierarchies of staff and the endless corridors quickly had her regretting her decision to leave home. Her duties are described to her on the first day: she is to look after "milady's" clothes, lay them out for her each day, brush her hair for an hour and a half each day, keep her jewelry cleaned and safe, and whatever other whims took her fancy. Hilda was also quickly to learn that there was a strict social hierarchy "below stairs" that mirrored that of society in general. It was interesting that Hilda, the housekeeper, governess and butler were "head servants" and therefore superior to the rest of the staff. While she would have liked to make friends with some of the lower staff members, it just wasn't permitted. This strict division created even more difficulties when she and the chauffeur, Ronald, began "courting." Hilda only worked as a lady's maid for 5 years, when the outbreak of World War II forever changed the old social hierarchies. Both Hilda and the Countess enlisted in the Auxiliary Territorial Services, the women's branch of service. The Countess had fully expected that Hilda would be her "batsman" and continue serving her, even though there was a war on. The War Department had other ideas, however . . . I greatly enjoyed reading about the colorful and exciting life that Hilda had. She really draws the reader into her world. It's so enlightening to read about life in Britain between the wars, and get a first-hand glimpse of bygone traditions, such as life in service. Hilda really contrasts the hard, but happier life of her early days with the more permissive times of today, when people lack a sense of place and community. I'm thrilled that I got to spend some time in her world! Fans of Downton Abbey will notice lots of little touches that appear in the show (ironing newspapers, for instance).